Here’s a bit of info on each member of the Cubs starting lineup. Links on their names will go to photos of each player. You can click on the pic above to see larger view. CATCHER: The Cubs had a disastrous season behind the plate, as numerous catchers went out with injuries. Zach Taylor will be their starter for game 1, but Mike Gonzalez, Earl Grace, Johnny Schulte, and Gabby Hartnett all played in more than 20 games as well. FIRST BASE: Charlie Grimm mans the bag at first. “Jolly Cholly” as he’s known actually began his career with the Athletics in 1916 as a 17 year old. Ironically, while he is now playing against a team many consider the best of all time, that 1916 squad was the worst of all time. A .298 hitter, he’s even better known for his defense…and his vaudeville act. He’s a skilled left handed banjo player. SECOND BASE: Rogers Hornsby may be 33 years old, but he certainly shows no signs of slowing down. Five years ago, in 1924 with the Cardinals, “The Rajah” had one of the most remarkable hitting seasons of all time, batting .424. That’s a record I don’t foresee being broken for some time to come. He and Cobb are the greatest pure hitters in the history of the game. And though he doesn’t have as much power as Ruth, he can still pop that old sphere over the fences, hitting 39 homers and knocking in 149 Runs this year, his first season with the Cubs. The only knock on Hornsby is his attitude, which is why he seems to bounce around the league. But make no mistake…he’s still one of the premiere players in the Bigs, and he’ll have a big impact on this Series. SHORTSTOP: Considered the clubhouse leader, even at the young age of 23, Woody English is one of the few players on the squad who gets along with Hornsby, and his diplomacy has been vital in keeping the squad on even keel. A contact hitter and an average defensive shortstop, he batted .276 this season. LEFT FIELD: The Cubs outfield is incredible, as all three outfielders had over 100 RBIs this season, the only time in baseball history that has ever happened. * In left, they have Riggs Stephenson. Riggs is a question mark defensively thanks to a bad shoulder, but there is no questioning his offensive prowess. He put up a .362 average with a .445 OBP, with 17 homers and 110 RBIs. CENTER FIELD: There are few legends in baseball bigger than Hack Wilson. As sportswriter Shirley Povich once wrote: “He was built along the lines of a beer keg and not unfamiliar with its contents.” Hack has even admitted, “I never played drunk. Hungover, yes, but never drunk.” Hack hits even harder than he parties. This year, he hit .345 with 39 dingers and 159 RBIs. RIGHT FIELD: Out in left, the Cubs sport the fast, brash, and excellent hitting Hazen “Kiki” Cuyler. He began his career with the Pittsburgh Pirates, and was part of that Pirates team that won the 1925 World Series, so he’s got experience in these big games. 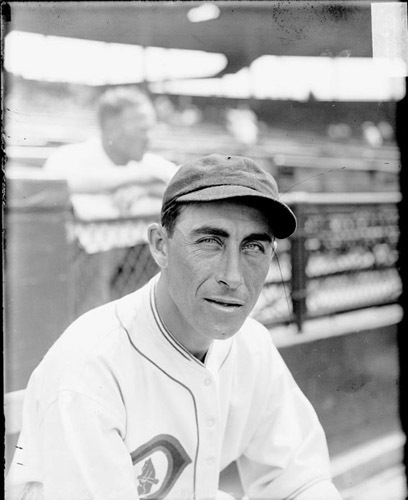 He was traded to the Cubs in 1927, and has done a stadnup job, batting .360 this year with 15 Homers and 102 RBIs. *As of 2012, it still has never happened again.